In a few days, sequestration hits unless Congress and the White House agree on an alternative to $85 billion in automatic spending cuts. Thousands of human service organizations would be affected, along with the communities, families, and individuals that depend heavily on nonprofit programs and services. 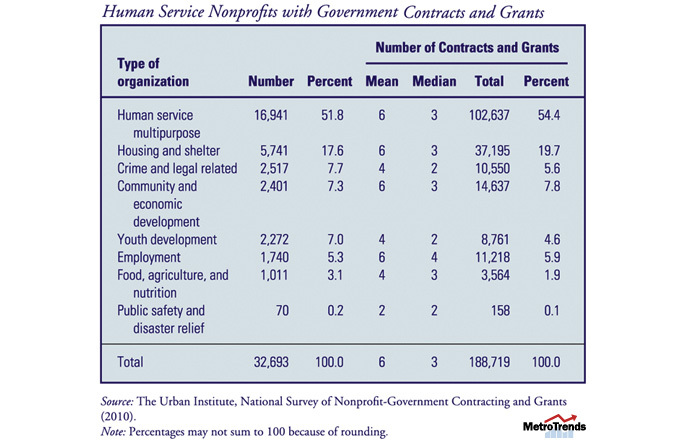 An Urban Institute national survey of human service organizations determined that in 2009, over 30,000 nonprofits had about 200,000 contracts and grants from federal, state, and local governments amounting to $100 billion. Government funding accounted for over 65 percent of the total revenue of organizations surveyed. Sixty percent of nonprofits said government contracts and grants were their largest funding source. 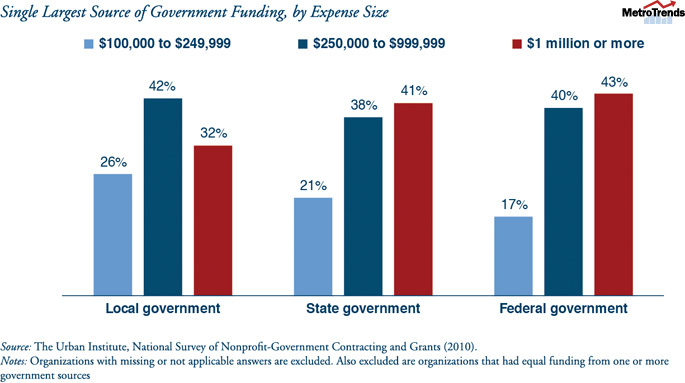 Among nonprofits that consider government contracts and grants as their largest source of revenue, 4 in 10 medium to large organizations (those with budgets over $250,000 a year), and 3 in 10 small nonprofits reported the federal government as their largest funder. Four in 10 of all human service organizations also said state governments, which act as conduits for federal monies, were their largest revenue source. Head Start, for instance, which provides grants for early childhood services for low-income families, stands to lose close to $622 million, which would result in 96,179 fewer children served. The Community Services Block Grant, which funds 1,100 community action agencies that offer crucial services to low-income families and individuals, is slated to lose over $677 million, which could lead to 1.5 million fewer individuals assisted. During the Great Recession, human services organizations’ revenue from all sources, including governments, fell. In 2009, nonprofits resorted to various cutbacks including freezing or reducing employee salaries, drawing on reserves, and laying off employees. Some took drastic steps such as cutting back on programs and services and serving fewer people. Should sequestration be allowed to take effect, human service nonprofits would lose billions of dollars in government funding and might have to make difficult choices, such as laying off much-needed staff, or worse, ending programs and serving far fewer clients. Ultimately, individuals and families who are just starting to recover from the economic downturn would suffer.